If you are looking for a growing base of fun-filled committed community leaders to share your talents with, look no further! The Jefferson County Chapter hosts over two thousand members from all over Louisville, Oldham County and across the bridge in southern Indiana. Our chapter hosts both the young and experienced from many different walks of life. 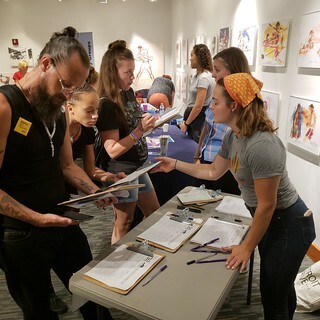 While actively supporting all of KFTC’s statewide campaigns, members in our chapter also have work on local campaigns around air quality, economic justice, and more. Since the chapter formed in 1983, we have supported and worked with allies on issues that affect you and me, including affordable housing, police abuse, sweat shops, hazardous waste reduction and recycling. Our doors are open to anyone who wants to fight for justice while building a compassionate, connected, and fun community here in our great city. Our chapter meetings are held on the 2nd Monday of the month, 6:30 to 8:00 p.m. and are open to the public. Anyone is welcome to attend.